Beautiful craftsmanship smothers every inch of this classic sword. The handle offers intricate nylon cord wrapping with cast metal pommel and guard accented with brass plated fittings. The 25 3/4" blade is heat tempered, carbon steel construction with Japanese symbolism. Includes a classic black lacquer scabbard. 40" overall. Good sword but dull. After sharpening it is better though. Sword came out of sheath dirty. Also sheath has a Crack in it. Besides all that I will thoroughly enjoy myself. Just got mine yesterday, right on schedule. It arrived in great condition, and though the saya isn't entirely as pictured, I am still very satisfied with my purchase. Potential buyers should know that it comes somewhat dull, so you may have to sharpen it yourself if you expect it to cut anything. 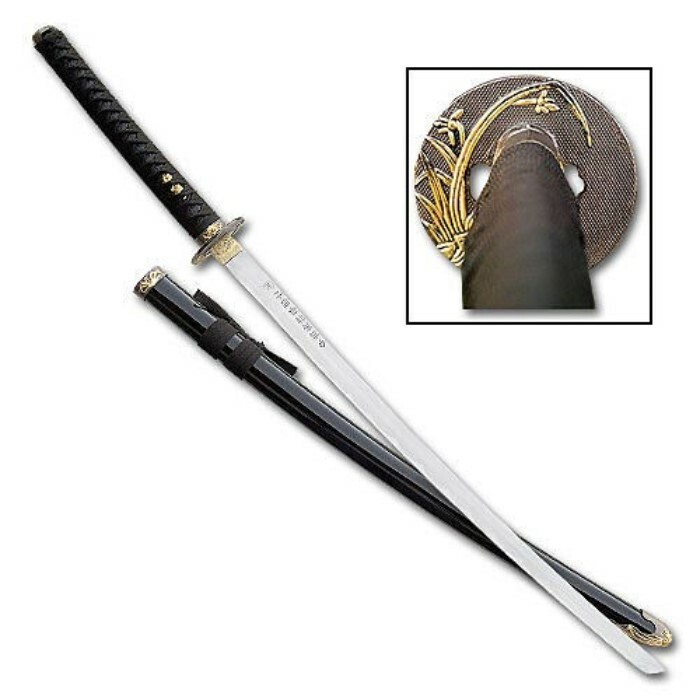 All in all though, it's a nice sword for $25. My only concern is in regards to the engraving; can somebody please translate? I have no idea what it says. Good quality, mine's different looking than what's in this photo though. Awesome blade. Love the design on the guard. translation of the engravings anybody? Good looking sword, lots of factory oil when i got it, has some scratches on the sword and came VERY dull. But after cleaning it, it looks way better. Haven't sharpened it yet, plan on doing that later. Overall good buy, especially for the price your playing, great decorative piece.